How vital is it for emerging economies to provide their citizens with mobile and Internet services at affordable prices? At first glance, the issue may seem secondary, perhaps even trivial,compared with developments in more traditional sectors such as automobiles, steel or financial services. But Mexico’s emergence as a major economy will be determined, in no small measure, by its ability to provide mobile phone and Internet services at prices that its citizens can easily afford, experts say. For Mexico, the second-largest economy in Latin America, there has been plenty of positive news during the past decade. From 2004 through 2012, the country experienced average annual GDP growth of 2.7%, achieving a record-high pace of 7.6% in June 2010 after sinking to a record low of -9.6% in June 2009. Buoyed by the economic recovery of the United States, by far its largest trading partner, Mexico enjoyed growth of 3.9% in 2012, and it is on pace to achieve about 3.5% this year. And yet, times could have been much better for Mexico if only the country’s telecom sector weren’t so over-priced and inefficient, economists agree. 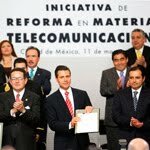 Between 2005 and 2009, Mexico’s “dysfunctional” telecommunications sector deprived Mexico of an estimated $129.2 billion each year — or 1.8% of its GDP — according to a January 2012 report by the Organisation for Economic Co-operation and Development (OECD), of which Mexico is a member. No wonder Mexicans of all political persuasions rejoiced this spring when the country’s bicameral Congress overwhelmingly approved President Enrique Pena Nieto’s sweeping plan to overhaul the country’s telecommunications regulations. The reforms will establish a new independent regulatory body in Mexico with the power to compel telephone and television service providers to sell assets if they control more than 50% of the national market share. Their most obvious target is Carlos Slim Helu, the wealthiest man in Mexico – and possibly the entire world, depending on the current price of his shares of America Movil. Slim’s America Movil controls a remarkable 70% of Mexico’s wireless market and some 80% of its landlines, contributing more than US$30 billion of Slim’s estimated US$67 billion net worth at last count. As of mid-March, Slim’s personal assets reportedly amounted to about 7% of Mexico’s entire GDP — far exceeding billionaire Bill Gates’ 0.45% share of the U.S. GDP and John D. Rockefeller’s share of less than 2% during his heyday in 1937. Both Slim and Gates have a net worth of some US$67 billion, according to Forbes Magazine. The reforms will also impose limitations on Slim’s competitor, Grupo Televisa, the second largest media conglomerate in Latin America behind Brazil’s Organizações Globo. Televisa commands a 70% share of Mexico's television audience. The reforms are also expected to spur foreign investment in the telecommunications sector, allowing foreign companies to become majority shareholders of Mexican companies in the sector. But how much will the telecom reforms help Mexico to become more competitive? What significance will they have for the PRI, the political party that ruled Mexico for seventy years before being pushed out of power in 2000? And why hasn’t Carlos Slim publicly spoken out against the reforms? Barbara Kotschwar, research associate at the Peterson Institute for International Economics, says that “Mexico is incredibly uncompetitive in telecom.” As Kotschwar points out, Mexico is the eighth-largest nation in the OECD, but it is 34th – dead last among OECD members – when it comes to fixed lines per 100 inhabitants. In the mobile sector, Mexico is the fifth-largest OECD member in total number of subscribers but when it comes to mobile subscribers per 100 inhabitants, Mexico is 33rd of the 34 OECD members. Kotschwar adds, “These telecom reforms are necessary if Mexico is to compete” in this sector — not just in fixed lines and mobile service, but also Internet broadband. How will the reforms attempt to bridge the gap between Mexico and more productive OECD nations? “The telecoms reform is far-reaching and revolutionary,” notes Duncan Wood, director of the Mexico Institute at the Woodrow Wilson Center, in part because it will create a new independent regulatory body that will have the power to restrain companies that have more than 50% of the market. In addition, it will open markets to new, smaller firms. “At its most extreme, the regulator will have the power to break up dominant firms, forcing them to sell assets,” Wood explains. “But the regulator will also possess the power to set maximum prices for interconnections, currently seen as being a severe obstacle to the emergence of rival firms in the fixed-line and wireless market.” Another significant dimension of the reform, Wood adds, is that foreign ownership limits in the phone market will be eliminated, allowing 100% foreign-owned firms to enter the market. During the late 1990s, several foreign firms attempted to challenge the market dominance of Slim’s Telmex and Telcel, only to discover that they were seriously hampered by foreign ownership restrictions and pricing issues. Under the new rules, the path will presumably be wide open for foreign competition to impel Slim’s companies to lower their prices. The new laws apply not only to the fixed-line and wireless sectors but also to television stations. The reform laws “represent an assault on the interests of the two dominant television companies in Mexico, Televisa and TV Azteca, both of which were heavily criticized during the election campaign for throwing their support behind Peña Nieto,” says Wood. For her part, Glover is optimistic about the reforms, noting that the newly returned PRI is “not the same PRI” that ruled Mexico with an authoritarian hand for seven decades. Mexico has become an “incipient democracy” in which there are free elections, although there is a “fairly weak civil society.” Glover argues that the PAN is “quite weak and in disarray,” and that the PRI has acquired a strong reputation for getting things done, eclipsing its early reputation for bureaucratic corruption and heavy handedness. Glover asserts that it is “very unclear” what policy issues remain between the PAN and the PRI. However, after 12 years in power, the PAN “needs to be doing a lot of soul searching” about its failure to deliver on its promises when it held the reins of power. Kotschwar cautions that the multi-party Pact of Mexico behind the telecom reforms – which brought together not just the PRI and PAN, but also the PRD (Party of the Democratic Revolution) and the PVM (Mexican Green Party) — could eventually fracture and Pena Nieto might find himself without enough support to get through the entire series of reforms. Regional politics could damage the coalition, since the parties in the Pact compete against one another for control of state and local governments. For his part, Castro warns, “It is important to remember that increasing investment in telecom networks and encouraging competition is only part of the solution. In addition to deploying advanced networks, there is still a need to focus on demand side adoption, such as fostering the use of innovative online services, increasing digital literacy and ensuring affordable access to computers." As for Carlos Slim, some people are wondering why he has not opposed the reforms despite their impact on his vast billions in net worth. Guillen argues that Slim is “very smart” and realizes that the best way to react to the reform “is not to oppose it, but to try to shape it.” Slim, he adds, apparently realizes that the reform is very popular, and that “if he opposes it, he loses face. He would prefer the status quo, but he knows that Pena Nieto is a moderate” and that the Mexican government is not going to take extreme measures that might seriously damage his personal wealth. According to the Mexican Bankers Association, private-sector loans amount to only 18.7% of Mexico's GDP, compared with 41% in El Salvador and 23.4% in Guatemala. The changes would presumably enable banks to lend more money, and would create incentives for midsize businesses to list their shares publicly. These reforms would also change bankruptcy laws in order to make it easier for lenders to seize the assets of borrowers who are in default. Opponents of the reforms assert that they could lead to a torrent of foreclosures, much like the surge that occurred in the United States during the global financial crisis. Further down the road, the Pena Nieto government is expected to lay out reforms for the energy sector. “The hardest reforms will be in the oil sector,” according to Guillen. There is strong political opposition to energy reform, given the iconic role of Pemex, the state-owned oil company, in modern Mexican history. “But telecom reform will be very popular,” and so the Pena Nieto government has moved decisively into that sector first.